Classically trained at Trinity College of Music, The University of Nottingham Music dept, and The Royal College of Music Jr Dept., Jessie has been playing the violin since the age of four. 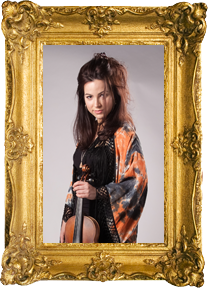 She is a versatile musician, playing chamber music to jazz, musical theatre to commercial. Jessie is frequently complimented on her rich tone, sweet melodic solos, and ability to adapt her playing and improvisationl style to music of very different genres. Touring has included Jessie playing with Katie Melua on her UK and European arena tour as part of the Secret String Quartet. As electric violinist Jessie plays all over the world; solo, with DJs and with other musicians. Her improvisation skills stretch folk to deep house and everything in between. Copyright © Steeleye Span. All Rights Reserved.